Glarsnot Bloodcurdle could almost taste the prized delicacy as he looked up from his battlemaps at the ancient, ruined city before him. Consultations with his Chaos allies had been brief at best. Indeed, to be honest, the Greenskin commander had dozed off a little while some very earnest (and hideously deformed) Chaos geek had explained the extraordinary scientific value of the Goatronium-enhanced rodents: Blaablahh mutation… blaa blaaa DNA…. blaaaadi blaa blaaa (evil maniacal/demonic laugh)…. By Mork’s bloody axe, the hummies—even corrupted, demon-infested, diseased and deformed hummies—could be so boring! All that Glarsnot really cared about was getting a few of those huge furry delicacies on a stick, and grilling them. There had been little discussion of a joint plan—the forces of Chaos were just too chaotic for that, and the Orks were thinking with their stomachs. The former would take the left flank, facing a contingent of Blood Angel Space Marines across the wreckage of the ancient industrial area. 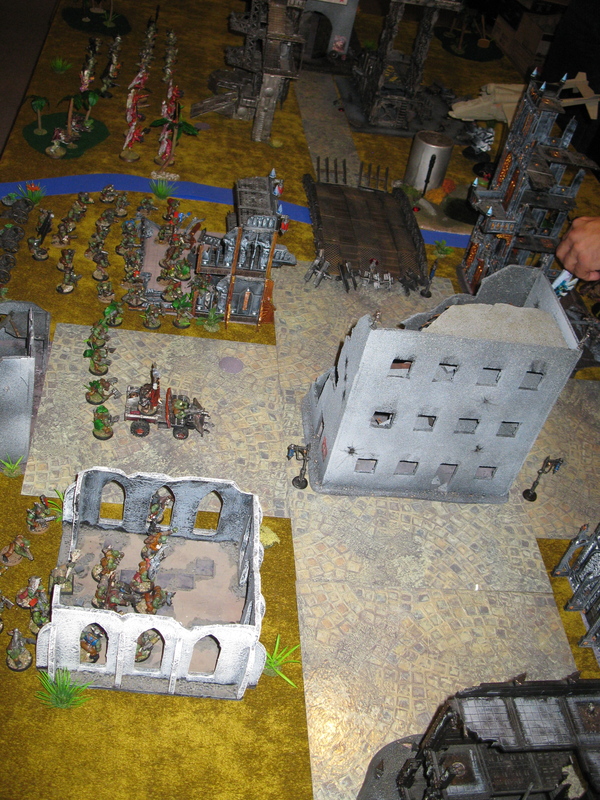 The Greenskins would take the right flank, facing Tyranids across the ruins of the shattered ancient city. And they would both look for rats. If the Chaos hummies could keep the Imperial hummies out of the Orks’ way, that would be good enough. Assault Squad (10) “3rd Blood Wing,” with Brother Sergeant Crassus. Succumbed to the Red Thirst at the beginning of battle. The battle started well, with the Ork-Chaos alliance seizing the initiative. As planned, the Kommandos raced for the nearest manhole, and headed down. Da Ratskewer Shoota Boyz took up positions in a ruin to the left of the sewer entrance, firing rokkits at the Marine’s Stormraven gunship and shaking it. Da Skeweratz Shoota Boyz and Zogwort moved into a ruin to the right. Glarsnot and the Ard Boyz moved behind the shelter of the large central ruin (which itself contained one of the rat objectives). The Lobbas immediately proved their worth by bringing a devastating salvo down on the unit of Gaunts nearest the sewer entrance across the battlefield. Seven of the ten members of the Tyranid horde were cut down by shrapnel, amid high-pitched squeaky cheers from the Grot gun crewz. The Tyranids responded by moving forward their fearsome Trygon Prime. The few surviving members of the wounded Gaunt unit started down the sewers, but made little progress. The Tervigon started to spawn another group of Gaunts, but then halted in a screech of pain as a claw lodged somewhere in the creature’s massive uterus. In a lucky break for the Orks, there would be no more Tyranid reproduction today. Meanwhile, as the Greenskin deployment unfolded according to plan, the forces of Chaos were less fortunate. (Picture right: CSM and Blood Angels prepare to go at each other.) A unit of Raptors had flown forward to seize the central bridge, hoping to secure two rats located nearby. They had underestimated the range of the jump-pack equipped Assault Squad and Furioso Librarian Venerable Guardian of the Word Lord Fineus. With a roar of rockets the Marines were upon them, slaughtering the defiled ones to a defiled man. With this the Assault Squad consolidated forward across the bridge, closing the distance to the Ork lines. The Stormraven moved forward, blocking Chaos access to the manhole and preparing to disgorge troops. Glarsnot Bloodcurdle looked with concern at the demise of the Raptors, and the sudden arrival of a powerful squad of Space Marines on his left flank. He had heard of the dangerous hand-to-hand abilities of the Blood Angels, and had no desire to let them get in the first assault. The Trygon Prime too could be extremely dangerous too. At all costs he had to buy enough time to get the Kommandos deeper into the sewers. Then, as if that wasn’t enough to contemplate, there was a sudden flash of lights on the battlefield, as someone—or something—teleported into the fray. Necrons! A unit of Warriors appeared near the Orkish sewer entrance, a unit of Immortals to the Orkish rear, and a second unit of Immortals on the Orkish right flank. The remaining Necron units were deeper into the Tyranid positions. No sooner had the cybernetic warriors blinked into existence than they opened fire, killing a few of the Shoota Boyz. Exterminate all life forms! Exterminate! Clearly the Orkish positions had to be stabilized, and stabilized fast. “OK, ladz… grab yer choppas and let’s go open some of dem der tin’eads!” he shouted to the ‘Ard Boyz as he led them from the Trukk and in a charge against the Necron Warriors. 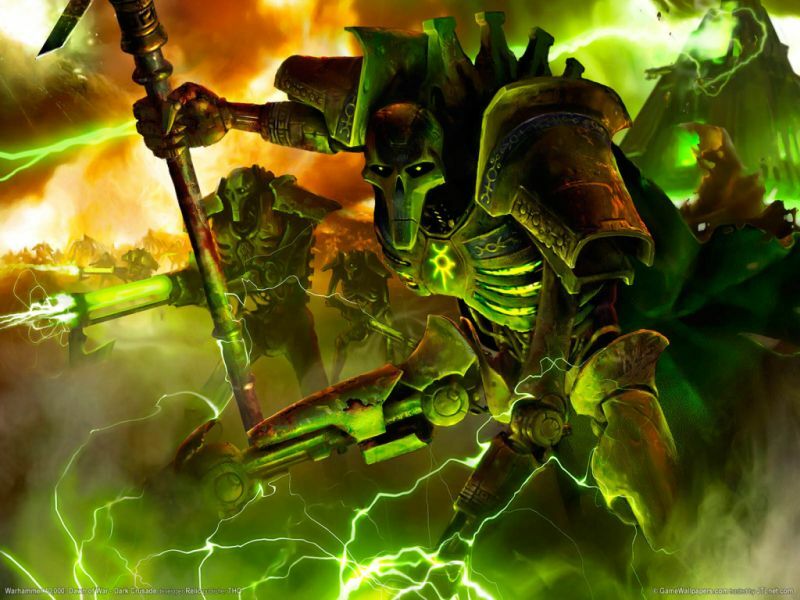 This they did, destroying much of the Necron unit. The Skeweratz to the right then opened fired on the Trygon Prime and wounded it, then followed up with a furious charge. While Not-so-Old Zogwort was cleaved in two by a gargantuan claw in the process, he inflicted enough damage on the fearsome creature to allow the rest of the Orkish unit to bring it down in a bloody heap. The Skeweratz then consolidated into the central ruin. Da Ratskewerz poured dakka into the Blood Angels, then charged. 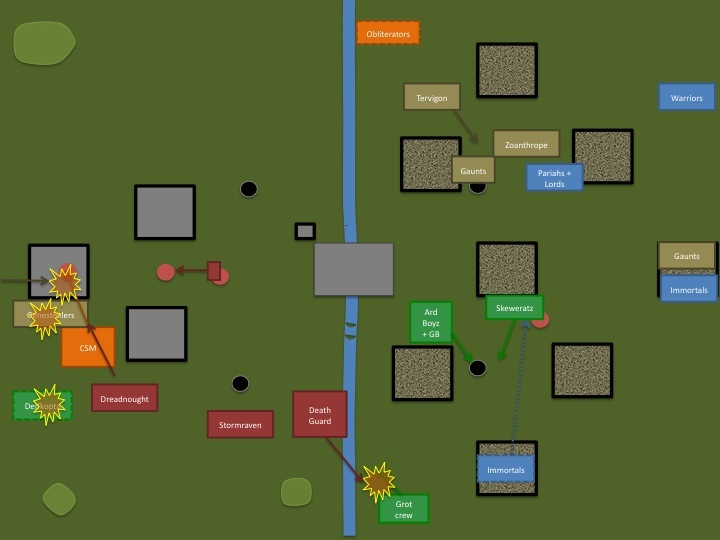 Unfortunately, in this case some forty or so shots failed to inflict a single wound, and the Boyz came out of the hand-to-hand combat much worse than their opponents. Still they hung on grimly. 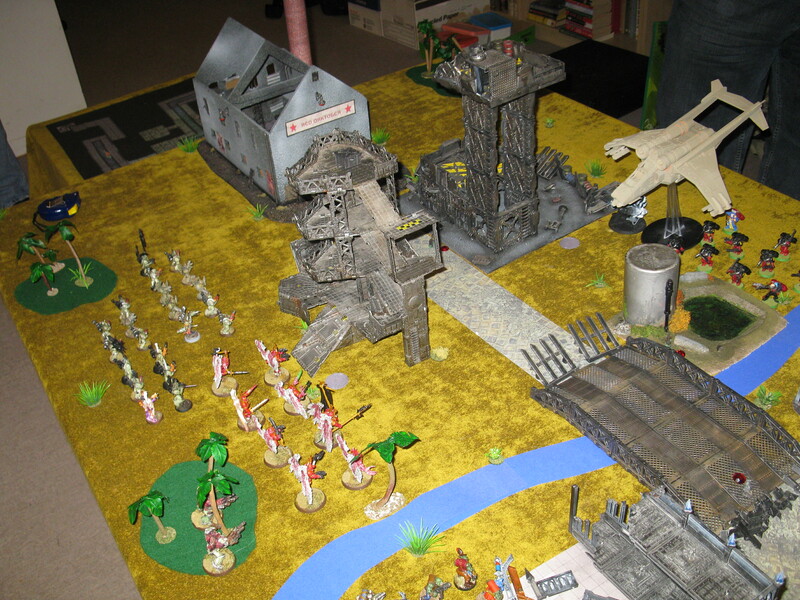 The Lobba pounded the newly-hatched Gaunt unit, inflicting a half dozen casualties. Below ground, the Kommandos ran forward, capturing their first rat in the process. Increasingly the Tyranids found themselves engaged with the Necrons. One unit of Genestealers arrived on the flank and slammed into a unit of Necron Warriors, but failed to achieve victory. A unit of Gaunts advanced on the flank towards a ruined building and a rat objective. As the Zoanthropes brought fire down on the Necron positions, one shot fell short and wounded the surviving Trygon. A unit of Lesser Daemons arrived to shore up the Chaos position. Still, things weren’t going less well for the defiled one. The Blood Angels’ Stormraven flew forward and disgorged Death Company in the midst of their positions, while the other Dreadnought rocketed forward to assist. The Lobba unit took some fire from the gunship, wrecking one of its guns and stunning another. The Necrons shot one rat as the Gaunts approached it, and tried unsuccessfully to shoot another in the central ruins before the Orks could capture it. The Pariahs and two Necron Lords also charged the Trygon and a Zoanthrope, killing both in close combat. The fighting continued between the Genestealers and Warriors, while the other Warrior unit was finished off by the Ard Boyz. With the Ard Boyz now freed up, Glarsnot Bloodcurdle lead them personally in a charge against the remnants of the Blood Angels Assault Squad. This was destroyed, with the exception of Sanguinary Priest Brother Hestus, who fled. Da Skeweratz Shoota Boyz in the central ruin secured a rat. 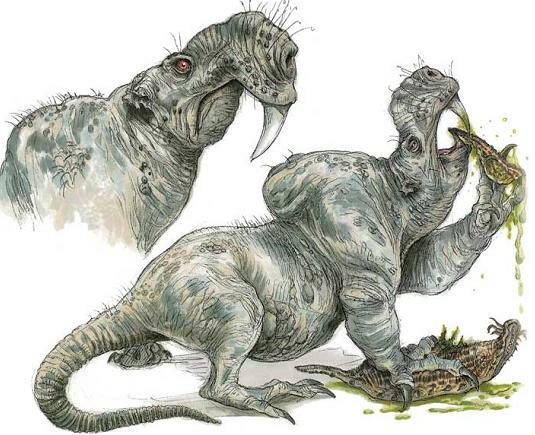 The Lobbas continued to pour effective fire on the Gaunts, reducing the number around the sewer entrance to a mere three. These would spend the rest of the game holding their position, and making no effort to push on into the sewer where they might face the larger and more capable unit of Kommandos. The Kommandos themselves, essentially alone beneath the ruined city, scored two more rat objectives—this time especially valuable rat swarms. A Deffkopta arrived, and was deployed to the far left flank to assist the forces of Chaos. It was too little, too late. The Blood Angels finished off a Chaos squad, the Daemons, and an Obliterator squad, leaving only a single CSM squad approaching the ruined factory and a unit of Obliterators in reserve, yet to arrive. Moreover, a unit of flanking Genestealers arrived close behind the Deffkopta, and destroyed it in claw-to-hand fighting. The Lobbas once again took fire from the Space Marines, destroying the last of the guns. Miraculously (or perhaps it was the whip, Grotprod, and Squig Hounds of their Runtherd), the crew’s morale held. The Necrons finished off the Genestealers, and also charged into the ruins to engage the Gaunts. They also brought some fire down upon the Zoanthropes and Tervigon, as well as the Orks in the central ruin, killing all but a few of the Skeweratz. They also killed a second rat near the bridge. For Glarsnot Bloodcurdle, the primary concern at this point was to safeguard his successful mob of Kommandos deep underground. 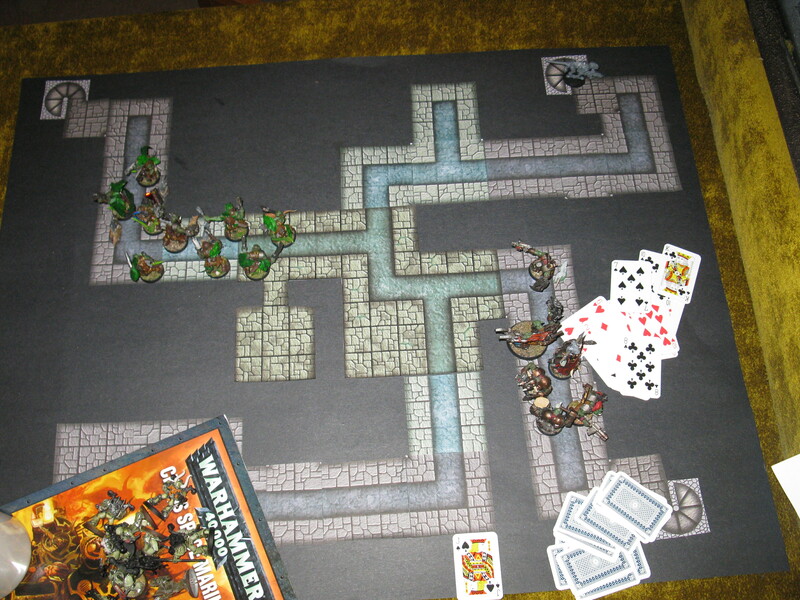 While the former collected their fourth rat, the two remaining mobz on the surface fell back towards the sewer grate to either defend it or join the Greenskins below. To distract the approaching Blood Angels, the remnants of the Lobba crew were sent towards them, thereby attracting their rage away from the Orks guarding the vital manhole. A Deffkopta arrived, and it too was deployed to the far left flank to assist the forces of Chaos. It was soon destroyed. Two Chaos Obliterators, the only surviving Chaos forces, arrived by deepstrike in the Tyranid rear. They failed to hit much. The Chaos squad killed the Genestealers, and moved into the factory. They were pursued, however, by Death Company Dreadnought Brother Gambinus and a second unit of Genesteelers arriving on their flanks. While the latter couldn’t catch them in time, the former did—wiping out the rest of the squad but being immobilized in the process. Meanwhile, Sanguinary Priest Brother Hestus, having collected one rat earlier, chased a second across the ruins of the industrial zone. The Death Guard crossed the river (losing two of their number to its treacherous currents), and charged the Runtheard and Grot gun crew. Not surprisingly, they killed them. With Tyranids, Necrons, and Blood Angels converging on his position—and with five rats now in Greenskin possession—Glarsnot Bloodcurdle decided that the best thing to do was to consolidate his defences in the fetid tunnels beneath the city. He, the few remnants of the Ard Boyz, and the sole surviving Nob of the Skeweratz all ran down into the sewers to join the Kommandos. The Trukk was sent off towards the raging Death Guard to once more draw them away from the Orkish position. They soon destroyed it, but lost precious time in doing so. There was more fighting up top: a Tervigon died, the Obliterators fired at something at missed, the Immortals and Death Guard eyed each other suspiciously. But it didn’t matter. Down below, the Kommandos lit a fire with their burna, and Glarsnot Bloodcurdle and Da West End Boyz enjoyed a well-earned treat of roast rat. The final score was Orks/Chaos 16, Necrons 2, Marines/Tyranids 2. I’m not sure that everyone enjoyed the game as much as I did, however. The CSM found their forces shattered early by the fearsome close combat skills of the Blood Angels, and had little to do the latter half of the battle. Most of the Blood Angels themselves were afflicted by the Red Thirst or rage, and as a result spend the game chasing after the nearest visible opponent. While this made them even more formidable in battle, it also meant they couldn’t enter the sewers (since they couldn’t chase what they couldn’t see). The Tyranids had some very poor difficult terrain rolls to enter the sewer, and in any case found most of their infantry pounded by Lobba fire, attacked by Necrons, or away on the wrong flank. The Necrons did well, but could never get anywhere near a sewer entrance to pursue the Kommandos. Overall, too, I think some players found the rat rules a little too complicated. That being said, everything worked out in accordance with Glarsnot’s battle plan, which had hinged on getting Kommandos into the sewer as fast and as far as possible, while others guarded the nearest entrance. Had more Tyranids gone below, I’m confident I could have bested them in close combat. Non-raging Blood Angels would have been a bigger problem, but there were only two units of those in any case. I’ll have to watch out for the Blood Angels in future: killing their Assault Squad took a unit and a half of Orks, and it was frightening how quickly the Stormraven’s cargo of Death Guard and Dreadnought cut through the CSM defences. Greenskin heroes of the day? The Kommandos and the Lobbas. The former (195 points) secured the objectives needed to win. The latter (a mere 94 points) killed more than a dozen Gaunts, and kept them from interfering below.